Ayurveda is the only system of medicine that advises treatments for the healthy persons too with an objective of preventing disease and maintaining themselves in a healthy state. The dual-aim of the Ayurvedic system of medicine is to maintain the health (or prevent disease) and cure diseases. Preventive medicine in Ayurveda is a vast subject with Dinacharya and Ritucharya as its primary arms. Dinacharya (daily regimen) and Ritucharya (seasonal regimen) are two important modes of maintaining good health. The routine may vary according to the time of the day and seasons since both tend to aggravate certain doshas. This ensures that the doshas are in a balanced state and the various channels are clear and devoid of blockages. A proper dietary regimen, adequate exercise, elimination of wastes and a regular routine to minimize stress should be part of daily routine. Dinacharya is the Sanskrit word for daily routine. Dina means a day and charya means routine. 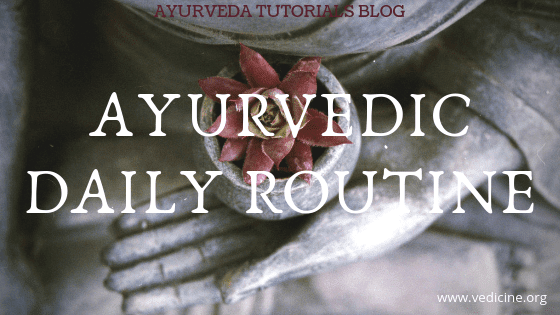 The sequence of daily routine activities mentioned in Ayurveda aims at maintaining the balance of doshas. The ideal time to wake up in the morning is the time before sunrise. Give yourself a minute or two to think about the day since your ability to concentrate, motivation and determination is greater than at any other time of day. Wash your face with room temperature water. The eyes, nose, and mouth should be cleaned with water. During the winter, when it is cold or if you suffer from a cough, cold or sore throat, it is advisable to use warm water to wash the face. Fill the mouth with water and hold it for 30 seconds. With the water still in the mouth, sprinkle water o your open eyes. Spit the water out, close your eyes and massage the eyelids gently with your palms for a minute. Ayurveda strongly stresses the importance of elimination of wasted from the body. This is as important as the nourishment it receives. Keeping tissues cleansed of wastes and facilitating their regular elimination through normal channels is the key to freshness and vitality. Drinking a glass of warm water after washing one's face helps in the elimination of wastes. It is advisable to avoid tea or coffee since they contain caffeine and can cause constipation. If there is no urge to empty the bowels, having another glass of warm water and walking for a little while helps in the downward motion of stool and gases and can stimulate evacuation. Once the bowels are evacuated, the teeth and tongue should be cleaned. An Ayurvedic toothpaste is recommended. Ayurvedic texts state the usage of small sticks (about ten inches long and as thick as finger) of various trees like Neem for cleansing the teeth. One end of the stick was crushed by chewing and then this brush-like stick was used to cleanse the teeth without hurting the gums. 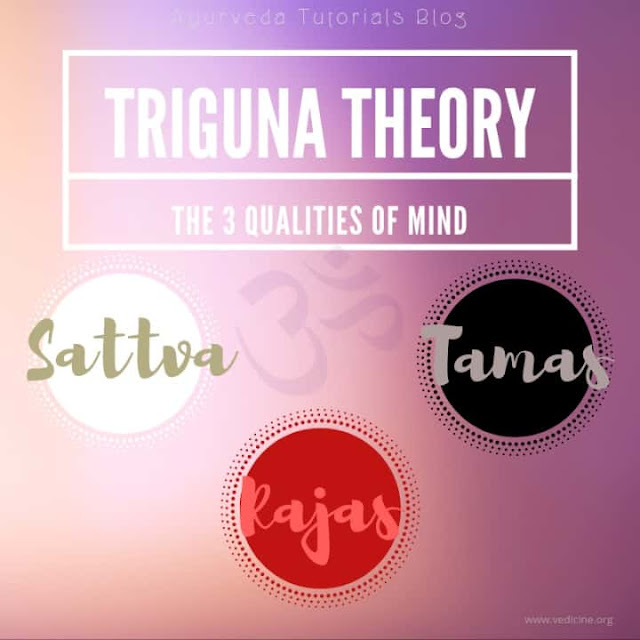 Branches of trees with pungent, astringent or bitter tasting branches including Karanja (Pongamia Pinnata), Karvira (Nerium Indicum), Arka (Calotropis procera), Malti (Aganosma dichotoma), Kakubha (Terminalia Arjuna) and Asava (Terminalia Tomentosa) were generally used in the past. The juice secreted from the branches of these trees and herbs, prevents dental diseases and strengthens the gums. In the modern lifestyle, it may not be possible to use these sticks but Ayurvedic tooth powders/pastes are good substitutes. The tongue should be gently scraped with a metal or copper scraper that can be obtained from a health food shop in the West. In India, they are available all over. Cleaning the tongue is essential because toxins are often deposited on it in the forms of mucus. In case a scraper is not available, use a metal spoon to gently scrape off the mucus. To ensure fresh breath, herbs like cloves, mint or parsley can be chewed. Gargle with room temperature water in summer and warm water in winter to remove food or herb particles and rinse the mouth. After cleansing the teeth and the tongue, you can chew one clove or fresh betel leaf. Chewing herbs keeps the mouth fresh, free from foul smell and also helps in improving the taste. Other herbs that can be chewed are Katuka (Hibiscus abelmoschus), Puga (Areca catechu), Sukshmaila (Elettaria cardamomum) and leaves of Jati (Myristica fragnans). Gargling keeps the jaws strong. This should be followed by simple exercise for 15 or 20 minutes. Yoga postures, brisk walking and muscle stretching help strengthen and improve co-ordination of body parts and relax the muscles. It also helps relax the mind important in today's world with stressful lifestyles. Simple breathing exercises (Pranayama) are good to enhance physical and mental efficiency and productivity. If there is only enough time for brief physical activity, the yoga routine, "Surya Namaskara" should be undertaken. When exercising, care should be taken to ensure one does not overexert oneself. It is better to be patient and work up to the postures gradually. The body will over a period of time adapt itself. Yoga exercises can greatly stimulate physical and mental heath. After exercise, a massage with warm sesame oil is recommended. In summer, coconut oil can be used. Alternatively, olive oil is a good substitute. Begin with massaging the head for a few minutes. Put one or two drops of oil in each ear and in the inner portion of the nose. Massage the rest of the body for at least 5-10 minutes. Ideally, this should be done every day but, if that is not possible, massage at least twice a week. The purpose of a body massage is to loosen and mobilize accumulated toxins in the deeper tissues of the body so that their removal becomes easy. A massage also tones up the body and skin tissues and results in a healthy body and glowing skin. It is particularly good for controlling Vata dosha that is often aggravated by modern lifestyle. Besides, it prevents and cures certain skin conditions like dryness, roughness and broken skin tissue. The massage should be followed by a bath or shower. This helps remove excess oil and improves circulation. If you desire to leave the oil on the body, the massage should be done after the shower. Excess oil can be wiped off with a towel. Natural soaps and shampoos could be used. After the shower rub the body with towel. This opens the pores of the skin, cleans the oil and increases the blood circulation. In some countries, it is a practice to shower at night, but bath in the morning keeps the person fresh and increases body energy. Follow with a round of meditation for up to 10 minutes. To meditate, wear clean, loose fitting clothes and sit in a relaxed position in a quiet, peaceful place. Clear the mind of thoughts and concentrate on your breathing or simply repeat a mantra or the word "OM", the cosmic sound. Breakfast should ideally be taken between 6 and 8 in the morning. Lunch can be in the period between 12 noon and 2 p.m. Dinner should ideally be taken by sunset and should be light. If that is not possible, eat at a time that allows you at least two hours for digestion before going to bed. Bedtime should be 10 p.m. at least. The diet should be adjusted for the time of day it is taken as well as for seasons. For instance, in the period between 10 a.m. and 2 p.m., there is a natural increase in the Pitta dosha in the body. This is ideal time for a heavy meal when the digestive power is at its highest. Once back home from work, it is advisable to wind down and relax for five minutes before starting on domestic chores. In the course of your daily activities, avoid stress and anxiety by choosing peaceful thoughts. Act with integrity and positivism. Take time out to relax even if it is only for a couple of minutes. These were some of the activities a person should follow to maintain a balance of doshas, nourish the tissues (Dhatus) maintain a high quality of immunity in the body. So start practicing some of these activities from tomorrow and you will see a a great difference in your health in a few weeks.